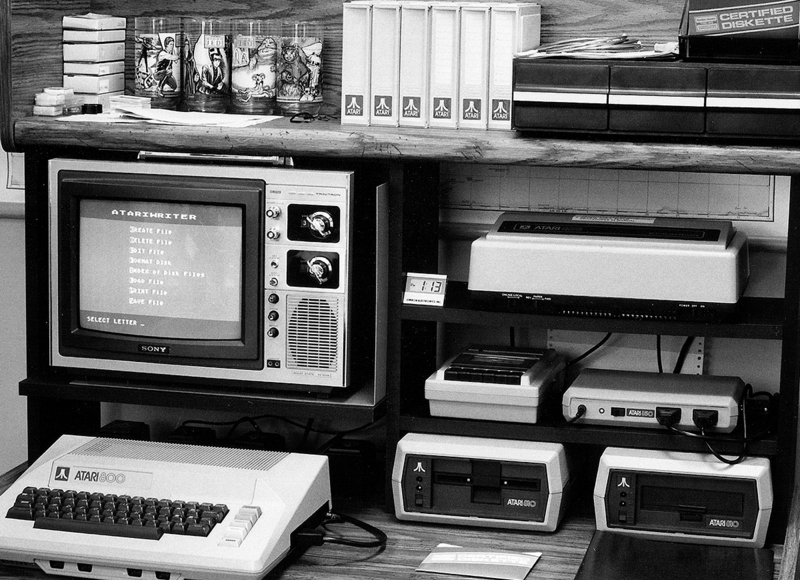 The scary bit is that looks exactly like the setup I had with my Atari 800, which I used all through school, right up until I went away to college. The differences are really small. But we had a similar ancient TV. We had the tape player (remember when you loaded programs via cassette tape?). At one point we had two separate floppy drives (the 810s), with the two different doors (one flips, one goes up and down), just like the photo shows (though, i think we had two because one broke, so I don’t think we had them lined up next to each other). I also don’t think we had an Atari branded printer. But, even the desk and the overall setup looks kinda similar to what we had. So I was looking at that and then started thinking… My parents pretty much declared their basement a federal disaster area after I went off to college (and yes, it’s my fault that it’s was a disaster), and have been waiting for the feds to send in a cleanup crew ever since. I know that they’ve finally been dumping out all sorts of old stuff over the past year, but if I remember correctly (and I might not) that corner of the basement has not been touched in 15 years. In other words, our Atari 800 with the similar setup and the crappy TV may STILL be sitting in my parents basement. I’m not back in NY for a couple months, but Mom & Dad, if you read this and if I’m correct that the old Atari is still sitting pretty in the basement, would you mind taking a photo and sending it to me? And, yes, I do talk to my parents regularly on the phone or via IM or email, but making the request by blog just seems like more fun. If I’m right, and the setup is still there, I’ll update the post with it once they send it. My God. It looks like the basement setup I had, at my parents house on Long Island when I was 15 (circa 1980). Only difference was that I had one disk drive and a Panasonic KXP-1080 dot matrix instead. Thanks for the memories. Those were the days!